Couldn't catch this spider web with the clarity of dew drops I usually like, but I did like the colors through it and the spider - don't usually find him sticking around. Wow ! This is big ,nice shot. the rainbow colours and the shape of the web, against a dark background,beautiful. This is amazing! An easy FAV!! That is one amazing web. Great pov Milanie and beautiful jewels! Outstanding pov, Milanie! This is such an interesting photo...love it! Wowser. What an amazing capture. From that POV it looks huge. Wow! Instant fav on that web! What an amazing pattern. Super capture! Amazing is correct! Awesome too! Super POV and capture. Fav! Magnificent! I love the composition and the point of view. We are still dry as a bone here with no rain in sight. So stunning. Fav and follow - although I thought I already was! Wow! You've done it again — captured the exquisite beauty found in a dew-drenched cobweb. Wonderful capture, especially viewed against the black background. 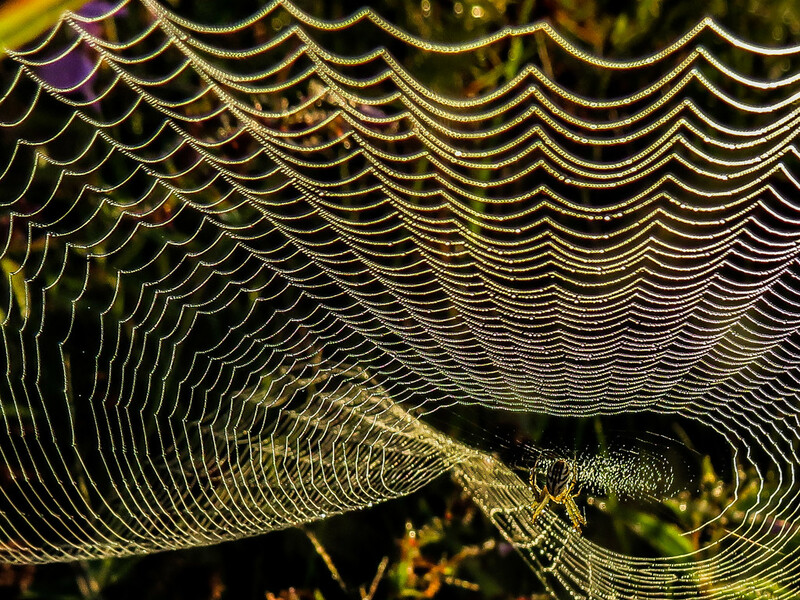 The web looks like an elaborate necjlace of gold beads. only way to describe it is AWESOME! Beautiful! Congrats on making TT. These little spiders sure do make some of the most beautiful webs.